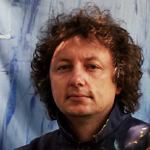 You are in: Galeria Art / Exhibitions / Jacek Łydżba / Holy Mother! Andy Warhol had a church in his native Pittsburg, while Jacek Łydżba has the Jasna Góra Monastery in Częstochowa. Has pop art perhaps grown out of the sacrum? A few months ago the Vatican’s L’Osservatore Romano described Warhol as a religious artists – his pious childhood, his liking for sacred paintings that he liked to surround himself with. 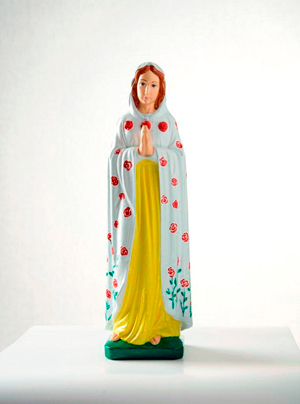 The author of the article even claimed that Warhol’s mass repeatability stemmed from religious art. 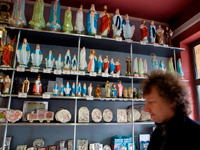 Jacek Łydżba treats religious symbols without any rebellion, personal disagreement or excessive rigour. As befits a pure-blood artist, he has his own vision and his own expression. He takes those gypsum figurines and dresses them up with garments in strong and expressive colours, emphasising their beauty and kitsch. Pop art? Definitely. But also a respect for tradition, for roadside shrines inscribed in the cultural landscape that he grew up in. Please, do not get us wrong – Warhol as a believer still wasn’t a religious artist, the same way the exhibition of Jacek Łydżba is not an exhibition of a church porch. It’s nostalgia in a more creative manner.